When we first purchased our home, the landscaping was acceptable at best. The previous owners had done just enough to make sure the front garden bed looked presentable in the listing photo by throwing some shrubs into the space (and I mean literally throwing, they were just pots sitting atop the soil not even planted lol) and planting a few petunias (which died before we even got close to closing). For the price of the home we didn’t very much care about the state of the landscaping but needless to say by the time we closed on the home the “garden bed” looked more like an open grave where plants went to die, haha. After tackling some of the inside projects spring rolled around and we decided we wanted to give our little front garden a little TLC, ya know, in order to have our home appear as though we were actually part of society lol. Since our original intention was to rent the house out when we moved, our main concern was to keep the landscaping simple and easy to maintain (in the event that we got a careless tenant, the landscaping wouldn’t go completely crap) and our secondary concern was obviously keeping the cost of the project down (and I mean WAYYY down haha). We decided to go with all perennials, the idea being to plant once and relatively maintenance free. While our landscaping tips are fairly obvious, a lot of people seem to think that you need to purchase expensive and pretty annuals in order to give your garden a makeover. Don’t get me wrong, I LOVE annuals, as well as your more demanding perennials (such as roses), they’re beautiful and if you have the cash and the green thumb more power to you. I, however, have neither of those things, annual means once and that means that if I spend $200 and a whole weekend gardening this year, I will be spending $200 and a whole weekend gardening next year – EWWWW! I like the more simple route, and I LOVE knowing that come snow, leaves, freezing rain, wind and whatever else the fall and winter have to offer, come spring those planted that I planted last season and forgot about until now, will come creeping up and grow themselves right back to their original beauty despite my lack of attention. 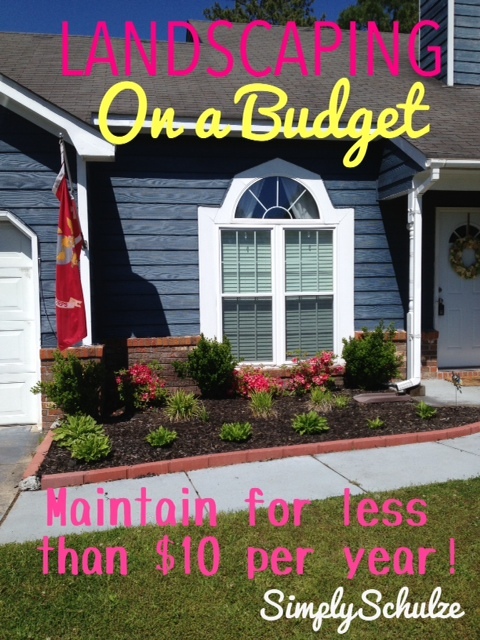 Here is what we did, how we did it and our tips for landscaping on a budget! WE DID OUR RESEARCH – Aside from the gardening I did with my Mom growing up (and by gardening I mean helping her to spend her money by going with her to choose annuals every year lol), I didn’t know much. So I hopped on the internet and asked the opinion of a few garden-savvy friends in order to get an idea of what would work best in our garden and most importantly within our budget. Once we decided what we wanted to plant we surveyed our little garden bed to see exactly how many of each plant we needed, the last thing we wanted was to have to make multiple trips to the nursery. Speaking of the nursery, be sure to ask their opinion as well, when I realized we were going to have a few empty spaces I asked one of the workers and they turned me onto a super cheap and easy plant that I’d never even heard of that totally worked! WE SHOPPED AROUND – While it may seem tempting to hit up your local home improvement store for plants and supplies all in one shot this is probably not in your best interest budget-wise. When comparing prices of the plants we wanted we found that the hostas we wished to plant were actually $4.00 more expensive at Home Depot than at our local nursery, while the azaleas were almost $12.00 more expensive!!! Additionally, the quality of the plants at our local nursery was much higher than at our local chain home improvement stores. While this may not be the case for you, my point is to be sure to compare prices, if we had bought our plants at the same time as our other supplies we would have ended up paying upwards of $100 more on our landscaping project! 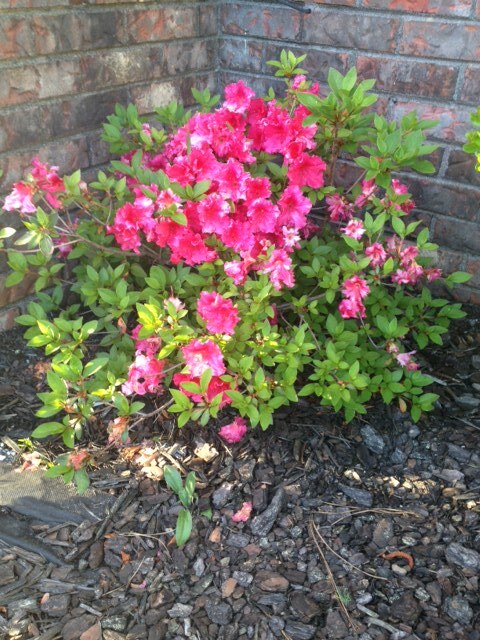 Azaleas (sorry for the crappy pic, but it’s just to give you an idea). These are beautiful springtime flowers available in vibrant colors that make your garden look fab. We planted small to save cash (I’ll explain later) but this particular variety has the potential to grow up to 4-5 feet tall. So in a few years the owner of this home will be thanking yours truly, although no thanks are really necessary since we only paid $11.99 per plant! Hostas – These plants are amazing, they do well in shade or sun so they are perfect for planting under trees. They require almost zero maintenance and while when purchased they will look like a dinky little plant they will grow outwards so they are a great garden filler. Oh, and they sprout pretty little purple flowers at some point during the season (not sure when, lol). These cost us $4.95 per plant. Liriope (pronounced LY-ro-pee) – A worker at our local nursery turned us onto these, they almost look like beach grass and make a great green filler for empty garden space. They grow outwards not upwards and sprout pretty little flowers that look similar to lavender. Again, very little maintenance is required and cost a mere $3.95 per plant. 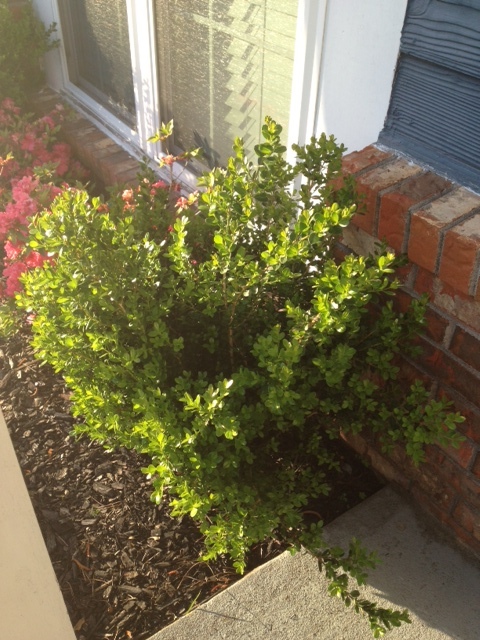 Green Velvet Boxwood – The one in the pic is kind of going crazy and needs to be pruned but whatever :). These shrubs require zero maintenance and will grow pretty tall (some can grow up to 10 feet, but can be pruned to any height). Since we already had three (thanks previous owners), we did not have to purchase any more for this particular area of our garden but I know that similar bushes cost about $11.99 at our local nursery. WE BOUGHT SMALL PLANTS – This was important in our cost saving strategy. We very easily could have purchased shrubs at their fully grown size, however this would have ended up costing us more than double what we spent. While mature shrubs may have looked a little nicer and I sure do admire my neighbor’s fully grown azalea bushes, the next size up at the nursery (not much bigger than ours and certainly not anywhere near the size of our neighbor’s plants) came in at $25.99 per plant, meaning that we would have ended up spending more on three plants than all of our plants and supplies combined. So if budget is important to you and you’re willing to be patient your plants will mature in just a few year’s time and in the meantime I promise your budget friendly garden will look great! 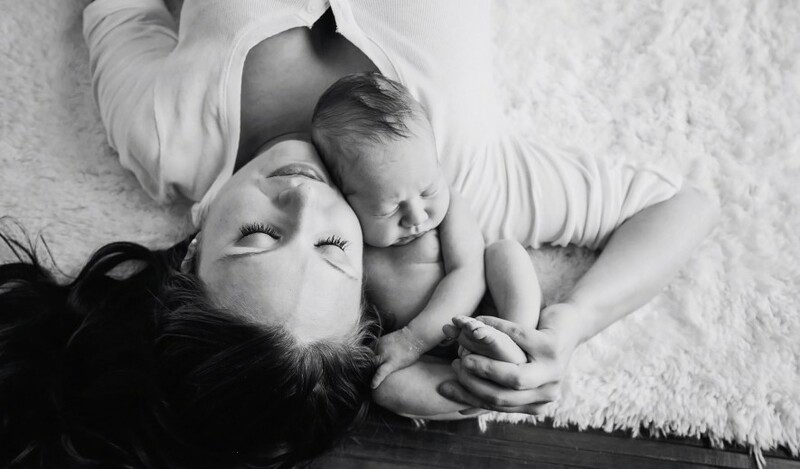 WE KEPT IT SIMPLE – And I mean simple, lol. We didn’t even buy a shovel (we used my husband’s “e-tool”, a little fold up shovel that the military issues you with your gear haha, one of our neighbors actually felt bad and came over and lent us a shovel, people must think we’re so weird lol). In addition to the plants we bought edging stones, basic landscaping fabric and mulch (I will review the products and costs below) and took only about an hour to plant and arrange everything – BOOM lol. *NOTE: we used landscaping fabric to prevent the growth of weeds and reduce the need for maintenance of the garden, it is not necessary, as we could have just laid the mulch on it’s own. A free way to mimic the function of the landscaping fabric would be to use newspaper, you would just have to replace it again the following season before you lay your mulch. Or you could use shower curtains … KIDDING, although that IS what the previous owners of the house did, so weird. *NOTE: These were also not necessary but we considered this our aesthetic “splurge” for the project. You could easily find free things in nature to edge your garden (like large rocks of various sizes) or not edge it at all. TOTAL COST $7.98 <—– that’s right, total cost for the second year was $7.98!!! Since all of our plants came back (miracle! lol) all we had to do was weed the garden then add some additional mulch, that’s it!!! If it doesn’t rain we give the garden a quick water every few days but other than that it takes care of itself. 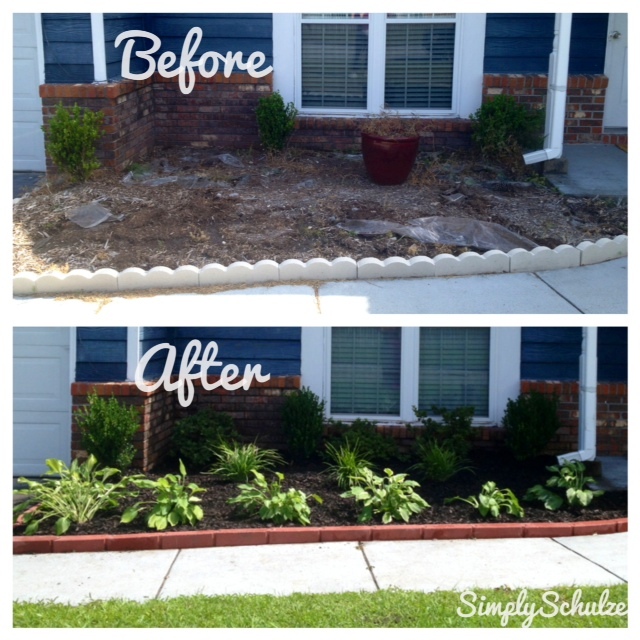 Now that you’re all hyped up about hostas and mulch (lol) I hope this inspires your own little budget friendly landscaping project, happy planting!! !